DYNAMIC FORCES® - DF SPECIAL - TITANIUM THURSDAY BAT-TRIFECTA! DF SPECIAL - TITANIUM THURSDAY BAT-TRIFECTA! 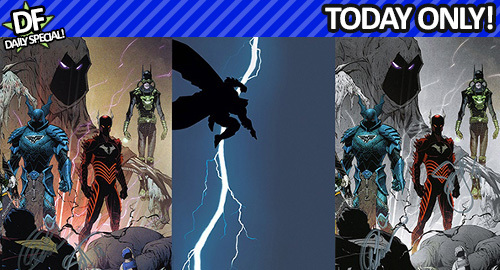 It's Thursday the 21st and we're celebrating the day after NEW COMIC BOOK DAY with not one, but TWO DUAL SIGNED collectible gems PLUS a CGC GRADED RETAILER EXCLUSIVE!!! DYNAMIC FORCES proudly presents, DARK NIGHTS METAL #5 PLANET COMICON EXCLUSIVE VIRGIN WRAPAROUND VARIANT DOUBLE SIGNED by SCOTT SNYDER and GREG CAPULLO in SILVER INK AAANNNDDD DARK NIGHTS METAL #5 PLANET COMICON EXCLUSIVE FADE VIRGIN WRAPAROUND VARIANT DOUBLE SIGNED by SCOTT SNYDER and GREG CAPULLO in SILVER INK which just happens to be ULTRA-LIMITED TO 500 PRODUCED!!! BUT WAIT!!! THERE!!! IS!!! MORE!!! Today and today ONLY, we're adding in the ULTRA-RARE BLACK FOIL ENCORE NYCC EXCLUSIVE, THE DARK KNIGHT RETURNS #1 CGC GRADED!!! Available today at the low, LOW DF DAILY SPECIAL event price of $119.39 in honor of the year Batman first appeared in the pages of DETECTIVE COMICS #27 way back in 1939!!! Only 7 sets will be available of this tremendous trifecta so be sure to lock your orders in TODAY!!! MISS FURY #5 - (1:15) "RISQUEART" RETAILER INCENTIVE COVER BY ALE GARZA!